We are a Trinidad and Tobago Tourism Industry Certification (TTTIC) approved Trinidad Guesthouse/Port of Spain Bed and Breakfast Trinidad Accommodation (small hotel) situated close to the Central Business District in the Capital City of Port of Spain, Trinidad on the main thoroughfare of the St. Ann?s Road and only five (5) minutes away from the main shopping area in downtown Port of Spain. We are also located approximately 35 minutes from Piarco International Airport. With public transportation at our gateway, access is easy and cheap to and from this Guest House. 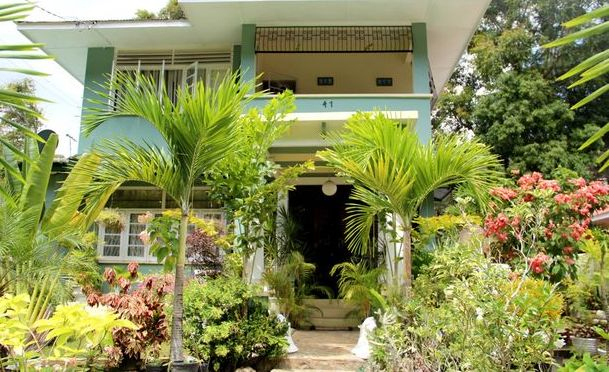 Our beautiful B&B/Guest House and Vacation Rental offers quality rooms in a clean, safe, secure, quiet and comfortable environment for both business and leisure travellers with low, inexpensive, competitive and affordable rates starting at US$30.00 per person per night with complimentary Breakfast. We are an inexpensive hotel which offers short-term and long-term vacation rentals for interns, professionals, researchers and vacationers, backpackers accommodation, hikers accommodation and student accommodation. All our rooms are of good quality with air-conditioned, cable television and hot and cold water. Wireless Internet is also available on the entire compound. We provide high quality budget accommodation in a secure, peaceful and convenient environment. Our personable service is evident by our highly rated testimonials from our past guests. Sporting needs:- Queen's Park Oval; Queen's Park Savannah; King George V Park; Lawn Tennis, Netball and Basketball Courts; Haseley Crawford National Stadium, Jean Pierre Complex; President?s Grounds. Medical needs:- St. Clair Medical Centre; Westshore Medical Centre; Port of Spain General Hospital; Seventh Day Adventist Community Hospital; Mount Hope Medical Complex and the St. Anns Hospital. Leisure needs:- Water Parks; Rivers; Swimming Pools; Maracas Beach; Caroni Bird Sanctuary; Botanical Gardens; Public Zoo; National Museum; Art Galleries; Pubs; Restaurants; Entertainment Centres such as Movie Towne and Queen's Hall; Port of Spain Waterfront; Cruiseship Complex; Tobago Ferry Terminal; San Fernando Water Taxi Terminal; Night-life is nearby in the suburbs of the Woodbrook and St. James areas. Business/Shopping needs:- President's Residence and Administrative Offices; Prime Minister?s Residence and Diplomatic Centre; Conference Centres; Auditoriums; Ministries of Government and Administrative Offices of Local Government; Malls such as Long Circular Mall, West Mall and Trincity Mall; Pricesmart Shopping Centre; Downtown Shopping; Major Hotels; Supermarkets; Pharmacies; Insurance Companies and Commercial Banks. Religious needs:- Churches; Temples and Mosques. the British, Canadian, Indian and Jamaican High Commissions. We are strategically located to all our Annual National and Cultural Festivals and festivities such as Carnival, Divali and Emancipation celebrations, among others.